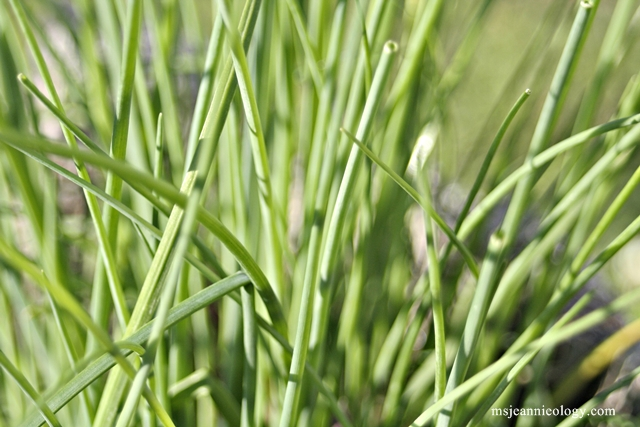 Ms. Jeannie’s chive plant reseeded itself from last year (good little plant!) and this summer has decided to go at growing with passion. When the stalks reached 2 feet, it was time for a hair cut. Not wanting to waste any bit of these little delicates Ms. Jeannie searched high and low for a recipe that would incorporate cupfuls of chives instead of just bits of sprinkles here and there. 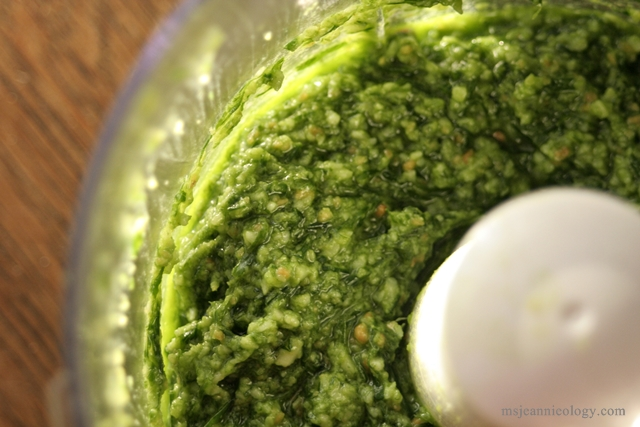 And surprisingly, it was harder to find than you might think – until she stumbled upon the Garden for A House blog and Kevin’s unique spin on classic pesto. 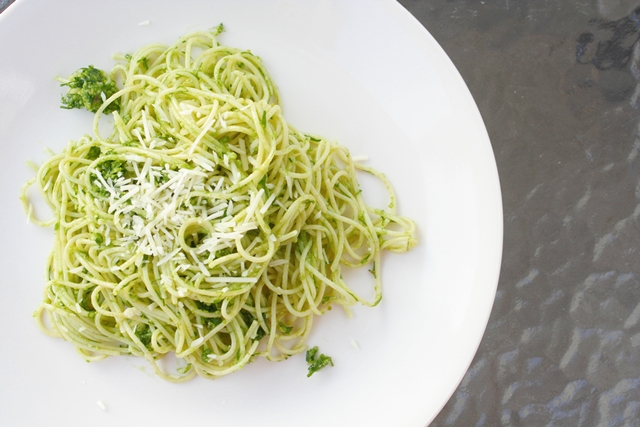 Instead of traditional basil as the main green, he used chives! Perfect! 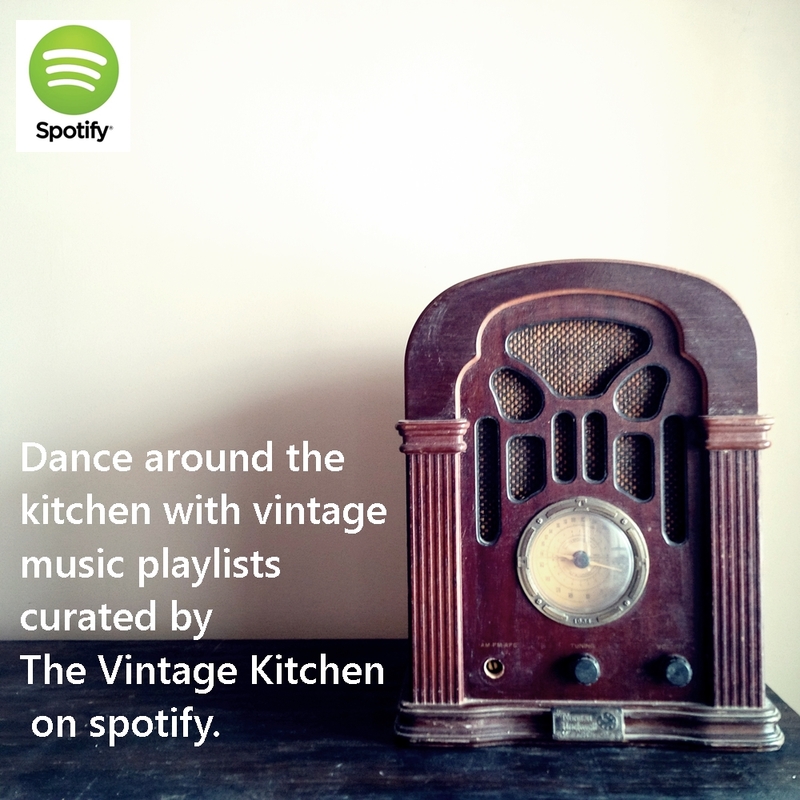 She whirled all that together in her little food chopper until it formed a nice consistency – chunky but spreadable. And voila! Dinner was on its way to being done. 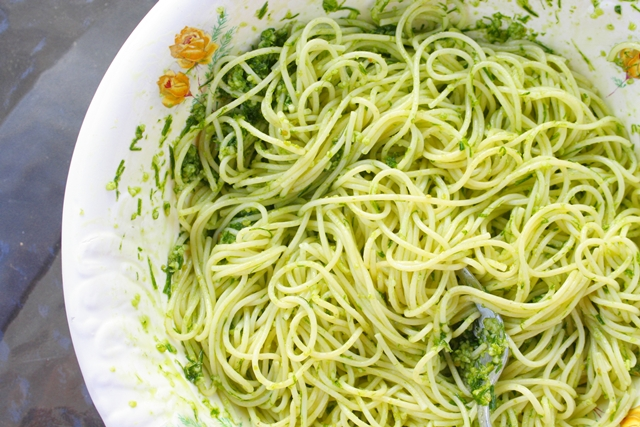 You could use this pesto lots of different ways – Kevin recommended fish, toasty baguette slices or pasta. and tossed it all together in the vintage bowl that she has for sale in her etsy shop. This bowl gets lots of attention but no one has claimed it for a treasure yet. Ms. Jeannie thought it might help if she incorporated some “action” shots and indeed those little yellow flowers do look pretty against all that bright green! After tossing, she let the pasta/pesto mixture sit for about 20 minutes to cool down to room temperature and let the pasta soak up the sauce. Needless to say this was all in all an effortless dinner – with just under 15 minutes from prep to finish. And Ms. Jeannie accomplished two feats in one – substantially cutting back the onion patch and making dinner. Oh the ease of the summer lifestyle. 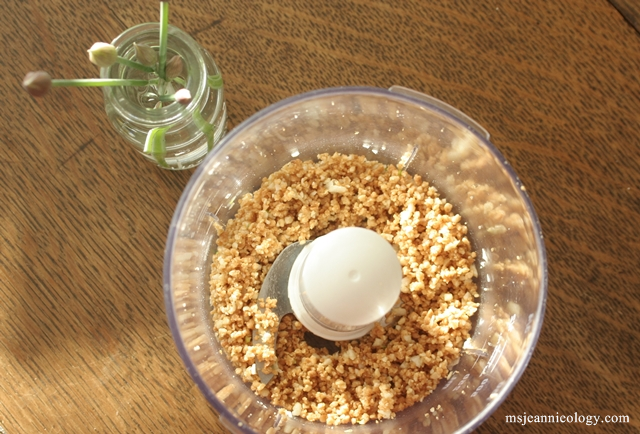 Chop your nuts first in a food processor or blender and then add the rest of the ingredients and mix until combined. 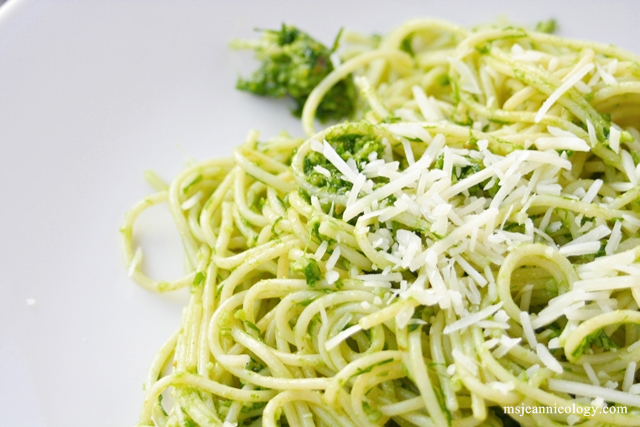 You may need to add more olive oil for a looser pesto, depending on the type of consistency you like or how you plan to serve it. And you may want to add salt or pepper at the end – although Ms. Jeannie added neither – the cheese made it savory enough and the garlic added quite a bit of spicy flavor. A great BIG thank you to fellow blogger Kevin for his ingenious recipe and for helping Ms. Jeannie not waste one little bit of her summer garden harvest. Stop by and read Kevin’s blog here. 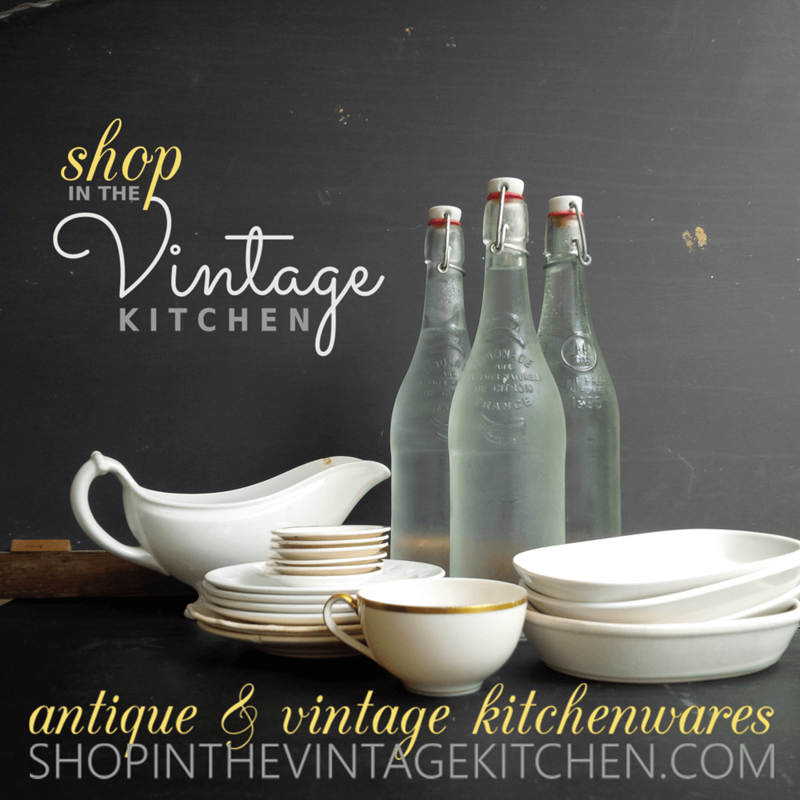 And if that serving bowl caught your eye, you can find it here in Ms. Jeannie’s shop! The next herb to tackle is the oregano. If anybody has any great recipes for oregano enmasse please comment below! In the meantime, happy garden cooking! Next Summer in a Nutshell! Hi Mis. Jeannie…try Lemon Oregano pesto! Oh that sounds delicious! Thank you so much for the link! Hmmm. No oregano recipes for you, but I’m clapping my hands with excitement over a fun new idea for pesto and all those chives growing in the garden! Thanks. Oh cheers to summer recipes!